Thursday is here. The trading day is nearly upon us. 1. Shifting markets: U.S. stock futures are looking relatively solid ahead of the open and the global bond market has stabilized after a bout of volatility. The U.S. dollar is dipping against most major currencies and the euro is strengthening. European markets are mostly declining in early trading. Asian markets ended with mixed results. Crude oil futures are dipping back down to around $60 per barrel. The price of oil has jumped by about 13% this year after plunging in 2014. 2. Another airbag recall: Honda (HMC) has recalled an additional 4.89 million cars equipped with possibly faulty airbags manufactured by Japan-based Takata (TKTDY). Honda's recall comes one day after its Japanese counterparts Toyota (TM) and Nissan (NSANF) recalled 6.56 million cars of their own. Takata shares fell 5% in Tokyo. 3. Stock market mover -- Shake Shack: Shares of Shake Shack (SHAK) rose in extended trading after the company reported better-than-expected earnings. 4. Earnings and economics: Kohl's (KSS) and British soccer club Manchester United (MANU) are reporting ahead of the open. Nordstrom (JWN) and El Pollo Loco (LOCO) will report after the close. The U.S. government will report on weekly jobless claims at 8:30 a.m. ET. 5. Wednesday market recap: Wednesday was a mild day in the markets. The main U.S. indexes only made minor moves. 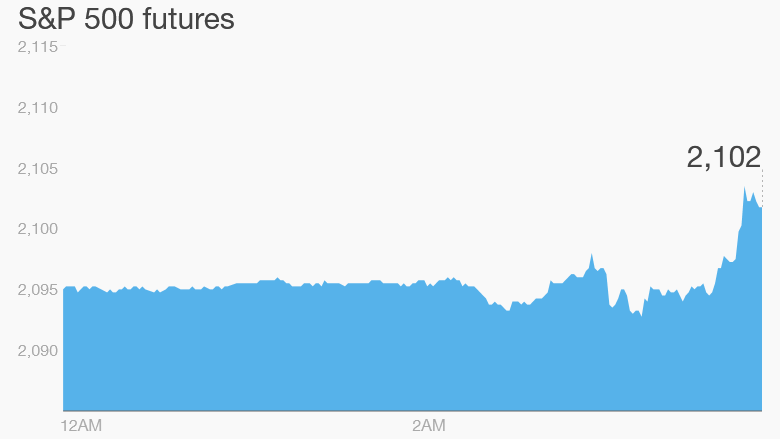 The Dow Jones industrial average lost 8 points, the S&P 500 was essentially unchanged and the Nasdaq edged up by 0.1%.